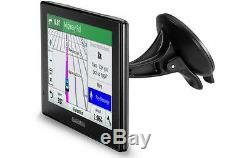 New Garmin DriveSmart 61LMT-D 6 Inch Sat Nav Full UK & Europe Lifetime Maps. The Garmin DriveSmart 61LMT-D with Full Europe Maps 6 Sat Nav with a beautiful 6.95-inch edge-to-edge display, keeps you connected and on course with free lifetime maps of the UK, Ireland and Full Europe (45 countries) that you can easily update with built-in Wi-Fi. Increase situational awareness with helpful driver alerts for upcoming sharp curves, speed changes, railroad crossings, school zones and more. 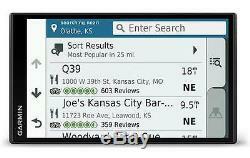 Garmin DriveSmart 61LMT-D with Full Europe Maps 6 Sat Nav. Keep your hands on the wheel with Bluetooth hands-free calling, voice-activated navigation and onscreen smart notifications (calls, texts and other app alerts). Enhance your journey with FREE Garmin digital traffic, real-time parking information, Live Track feature and TripAdvisor data. 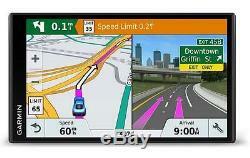 Garmin DriveSmart 61LMT-D with Full Europe Maps 6 Sat Nav Extra Info. 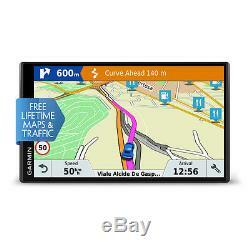 Easy-to-use sat nav with a beautiful 6.95-inch edge-to-edge touchscreen display. Preloaded with detailed maps of the UK, Ireland and Full Europe (45 countries) with FREE lifetime map updates. Free Garmin Digital Traffic via DAB provides reliable traffic alerts to avoid incidents and congestion on your route. Youll know how many minutes of delay to expect and if there are any possible detours. It can even confirm whether or not you are on the fastest route. Live parking information for on and off street parking at your destination. Pair your smartphone and your sat nav via Bluetooth to get hands-free calling, voice-activated navigation and smart notifications for calls, texts and other alerts straight onto on your sat nav screen. Built-in Wi-Fi for easier-than-ever map and software updates when connected to a Wi-Fi home networkDriver awareness features include alerts for dangerous curves, speed changes, railroad crossings, animal crossings, speed cameras and more. Fatigue warning suggests break times and potential rest areas ahead after hours of driving. Active Lane Guidance with voice prompts will guide you to the proper lane for your route. PhotoReal and Birds Eye junction views help you navigate junctions with ease. 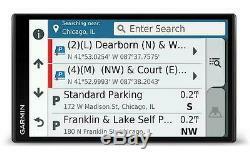 Garmin Real Directions provides detailed guidance using landmarks and traffic lights. Pair your DriveSmart with your compatible Garmin smartwatch to receive navigation, find my car and driver alerts right on your wrist. Live Track allows drivers to share their routes with others. TripAdvisor ratings for travel points of interest (POIs) such as hotels, restaurants and attractions. Foursquare points of interest data add millions more new and popular places like restaurants, shops, services and more to your search. 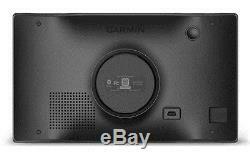 Garmin DriveSmart 61LMT-D Sat Nav. The Best Brands is a Trading name of JD Sales LTD which is a family run business with over 30 years experience, providing quality service to our customers! Here at Best Brands we believe in bringing you the latest Must have Technology and Consumables at prices which are better than anywhere else. The products we sell, we are fully authorised retailers for. All of our products are of top worldwide brands, For example: Garmin, TomTom, Mio and Casio. We also have a busy town centre retail store where items can be viewed or picked up. We carry stock of all the top brands that you will find in the big department stores but offer huge savings. Your statutory rights are unaffected. If you choose to return an item, please do take care of it whilst it is in your possession. Please return your unused product; with the original packaging, accessories and manuals. Items that have had holes drilled through them. In the event that the services are provided with your agreement prior to the end of this 14 Calendar day cancellation period, you lose your cancellation rights from the moment that the services are provided to you. Get all the latest News, Updates and Special Offers about our store. The item "New Garmin DriveSmart 61LMT-D 6 Inch Sat Nav Full UK & Europe Lifetime Maps" is in sale since Thursday, August 10, 2017. This item is in the category "Vehicle Parts & Accessories\GPS, Audio & In-Car Technology\GPS & Sat Nav\GPS Systems". The seller is "the_best_brands" and is located in Warminster. This item can be shipped worldwide.